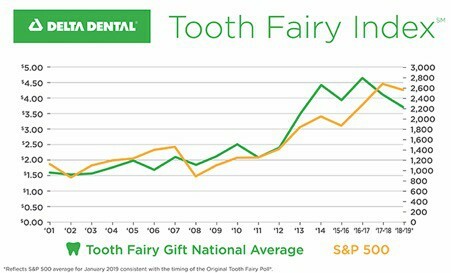 Kids seem to have put the bite on parents when it comes to forking out cash for losing those baby teeth. The going rate for a tooth varies between countries. The luckiest kids receiving the most cash are in the UK, where some mums report replacing a first lost tooth hidden under a pillow with a crisp £10 note and £5 for the rest. Not all children are so lucky. Other mums and dads only leave ‘silver coins’ – anything from 5p to 50p in the UK. A recent study in America by Delta Dental Plans Association found the average pay-out is US$3.70 for a tooth – 10% down from a year ago. The study is carried out each year, and weirdly reveals that the amount left under the pillow for American kids rises and falls in line with the annual percentage change in the Standard & Poor’s 500 stock index for 14 of the past 17 years. The unluckiest kids in America live in the Midwest, where cautious parents only hand over and average $2.97 a tooth. Over the years, milk teeth can cost parents a small fortune. Children lose about 20 teeth between the ages of six and 12 years old. At £10 a tooth, that’s a tidy £200. Now multiply that by two, three or four, and the lay out can be quite significant. Nearly half of children (48%) seem to save the cash they receive mysteriously during the night while they are asleep, says the Delta Dental Plans Association. The tradition is thought to have started in Northern Europe with tand-fe or the tooth fee. The lore states that when children lose one of their baby or milk teeth, they place it under their pillow when they go to bed. The fairy then visits while they sleep and replaces the tooth with money.